15-days of special broadcasting in which we will try to dwelve into many possible different sonic dimensions of the South: what is it? Is it just a matter of latitude? Is it a phenomenon, is it a method, a cliché? Is it possible to define or to open up the geographical scale of the South? How do we look at it? In the face of the multiplicity of borders, how can we approach it, without reducing the discourse to mere geographical terms? without reducing its complexity into a monolithic phenomenological entity through which and unlike to we define ourselves? In collaboration with Saout Radio and Reboot.fm. We look for you, musicians, activists, composers and artists, to share your inspiring contribution on this arduous and slippery field of investigation. We need to test our medium and our means. Be it acoustic experiments, songs, field recordings, philosophy, poetry, travel or geographical advice, South-notion related classical or electronic compositions, documentaries, interviews and chats ‘going south‘. Be it music, playlists, a radio show or features, we are looking forward to listen to how the notion of South may be reflected in your own work and research. We don’t ask for original soundworks, but recent and less recent works are all welcome. _one selected soundwork will be awarded € 200,00. 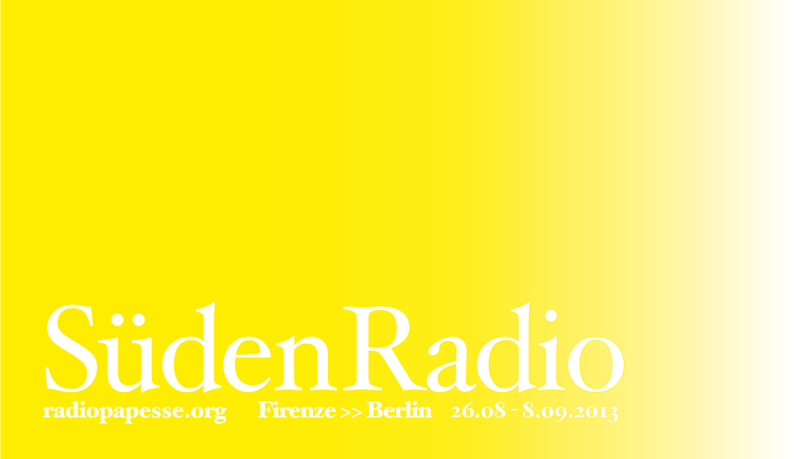 The selected work will be announced Sunday, September 1st during Süden Radio LIVE @ at 8PM on Reboot.fm, Berlin. The selection will be up to a jury composed by Radio Papesse, Saout Radio and Villa Romana. _a photo relating either to you or your work (max. 200 kb). Radio Papesse is a non-commercial production platform. The copyright for submitted files remains with the artists. A selected number of your submissions may be presented on the website as a public archive. For this, we would then need your consent in writing. The licensing format we ususally adopt is the Creative Commons License but we’re up for other licesing suggestions. Radio Papesse [www.radiopapesse.org] places itself on the irregular border where art and sound converge. Not a magazine, nor an artistic project, rather it is a method of production we have been pursuing since 2006 and that is gaining strenght from its relational dimention. As Gregory Whitehead reads “Radio is mostly a set of relationships, an intricate triangulation of listener, ‘player’ and system”. We try to be in the middle of it. Radio Papesse is a webradio streaming 24/7 and a free online sound archive growing day by day. RP is based in Florence, Italy. Saout Radio [www.saout-radio.com] is a webradio project inspired by the need of a research on contemporay artistic practices in relation to the sonic and radiophonic language. It was founded in Maroc by artists Younes Baba-Ali and Anna Raimondo and it aims to promote the research and practice of sound art in Maghreb, Africa and Middle East. Saout Radio is a project for the creation of transmission spaces and exchange on international artistic platforms. It supports different and hybrid forms of sound productions, from soundscaping to radio art from artistic documentaries to experimental music. Reboot.fm is an award winning artist run radio that broadcasts pop culture, politics, interviews, DJ sets, live concerts and experimental formats live from the House of World Cultures! Throughout centuries of European musical tradition, coincidence and the coincidental did not play a role in composition – Händel, Bach and Beethoven were masters of systematic composition and artistic perfectionism. Yet contemporary musical creations of the avant garde commonly employ coincidence as a means of composition. It is the transitory nature of the moment and the allure of the unpredictable that allow musical dimensions expand to the infinite. Together with international sound and radio artists, the festival Addicted2Random (A2R) examines through sound installation, radio art, exhibition and performance how the compositional style of classical European music and artistic work with coincidence can influence each other. For the festival’s radio programme we are looking for radio art pieces. The A2R festival is organized by free radio station Radio Corax. We will install a radio studio for three days (10-12 July 2013) in the birth house of Georg Friedrich Händel in Halle to broadcast live festival events. You are cordially invited to send us a contribution to the festival’s “Random Time Radio“ programme, including a brief description of your radio piece for our announcements. All pieces will be considered and if necessary a selection made. Unfortunately we cannot offer any financial support. The deadline to send audio files is 5th July 2013. Deutschlandradio Kultur, a national public culture radio channel in Germany, is starting a new series. “Kurzstrecke” (short haul) is a joint project by the producers of Freispiel (experimental radio drama), Klangkunst (sound art), and Feature (documentary) on Deutschlandradio Kultur. We are calling for innovative, timely, radiophonic audio pieces. We will select the most interesting submissions, and present them on our monthly late show “Kurzstrecke”. – the selected pieces will be bought for two broadcasts. All rights remain with the authors. – foreign language pieces should be intelligible for German listeners without translation. The Sound Bank is a new initiative from In the Dark, From first-time features to uncompleted passion projects, wild experiments to those great pitches that didn’t quite fit the brief, the Sound Bank is here to help you realise your ideas and explore the world of story telling in sound. How does it work? The Sound Bank scheme is offering funding of between £500 and £1500 towards the production of new audio pieces of 3 to 15 minutes duration each. Recipients of the scheme will also be allocated a ‘mentor’ to help with the artistic, editorial and practical realisation of their idea. The finished works will feature at In The Dark events and online. In addition In the Dark offers to promote winning commissions, liaising with broadcasters, webhosts, festivals and competition-holders across the English-speaking world. An independent jury of radio enthusiasts chaired by Nina Garthwaite will award up to four grants. The scheme is open to all – first-time producers and students, migrants from other arts and media as well as experienced radio professionals seeking the opportunity to attempt something bold and adventurous. COL-ME (Bratislava, Slovakia) invites radio makers, collectives and radio stations to take part in the making of a temporary radio station scheduled according to wind-time – our very own TIK Radio, to be transmitting over the TIK Radiodays from the 6th – 11th of September 2011. TIK Radiodays is part of TimeInventorsKabinet, a project dealing with alternative time control systems, investigating into time relations within biological and circumstantial ecologies. Within the frame of this project wind-time was established, that we take as a base for measuring a new time. Wind-time is time, that is not based on a regular intervall like a second is, but rather on the fact if wind blows or does not blow. Therefore it cannot be forseen, when the radioshow actually starts (starting time) and/or ends (length). With this event we would like to break the idea of time-based and time-related media and free it from its horrible boundaries of seconds, minutes and hours. See the original concept here. For contributors we have various approaches, how you can participate without screwing up your regular schedule(s) while a special unit in Bratislava is taking the adventorous approach from the 6th to the 11th of September. Pre-prepare or do live one or more radioshows or code a patch using data from the wind-time clocks. The TIK project runs a video and sound archive – padma – storing content made during workshops and working meetings. You might submit even unfinished small pieces or sounds into Padma (to be used by other participants), or use existing sound files in your show. Consider providing us with 3-30 minutes of your airtime (or more) to transmit shows done by collectives. TIK Radio will be transmitting over internet and apart from streaming shows submitted and done live there will be a constant static stream for the whole duration of the project. If you are interested to be part of the special unit in Bratislava and/or want to contribute in any other way or have more questions, please don’t hesitate to contact us! Radiophonic Creation Day on 4th June 2011 promises another twenty-four hours of unique and exclusive broadcasting simultaneously going out on stations all over the globe. And we’re planning to make it even bigger and better than before. But we’ll need help! We’re looking for Radio stations, websites, sound platforms and cultural organizations to join in and help us spread the word. Do you represent a station or broadcaster that would be interested in taking part ? If so, get in touch! All partners will receive a DVD containing the entire day’s programming as well as a selection of jingles and promotional material to help announce the event. You then simply play out the day’s programming, in whole or in part on 4th June 2011, joining an ever-growing number of stations across the world flying the flag for original independent radio and original creative talent in the process!